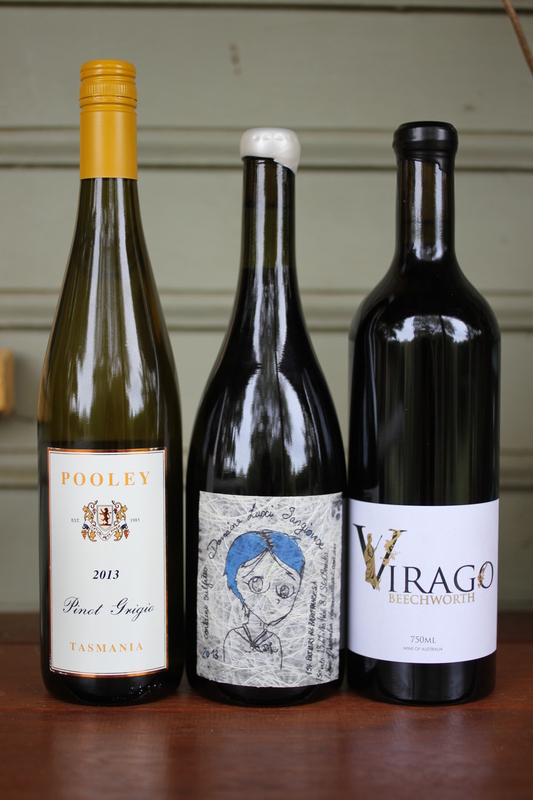 As my birthday falls in the month of April I decided to seek out three impressive wines with equally striking labels that would make the perfect gift…hint hint. Bibemus climbing every mountain. Yodel ay ee ooooo. On Wednesday 20th March, the Bibemus gang and their fellow Italophiles gathered together to taste a mountain of Barolo from Monforte d’Alba. Fourteen of them, to be precise. Special international guests included Massimo Benevelli of Piero Benevelli wines and Robert Bava and his daughter Francesca from Cocchi Americano. “Ask not what your country can do with my grapes, but what my grapes can do for your country.” Err, sure thing, Berlusconi. WHY AND HOW ARE ITALIAN GRAPE VARIETIES IMPORTANT TO THE AUSTRALIAN WINE INDUSTRY? DISCUSS FOCUSING ON AT LEAST TWO VARIETIES. Penfolds Grange is unquestionably Australia’s most famous red wine and has reached celestial heights in terms of adoration and expectation. From its experimental inception in 1951 by winemaker Max Schubert, Grange has been lovingly crafted to shine as a uniquely Australian wine of longevity, power and class. In line with the 20-year celebration of the Melbourne Food & Wine Festival, an event was arranged that could commemorate the significance of this anniversary. Two bottles each of Penfolds Grange 1971 and 1976 (tested by the clinic in 2011) were obtained from a close friend of the owner of my workplace. The extensive museum Italian wine list was pulled out for perusal. It was like being a kid in a candy store as eight other wines were chosen that hail from Italy which would sit alongside Australia’s most iconic wine. 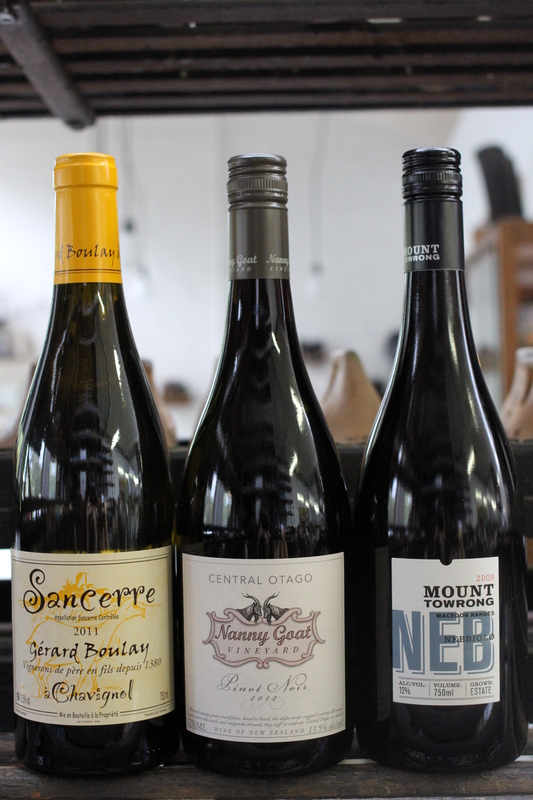 The wines selected are classified in the upper echelon of quality and come from the most respected producers. 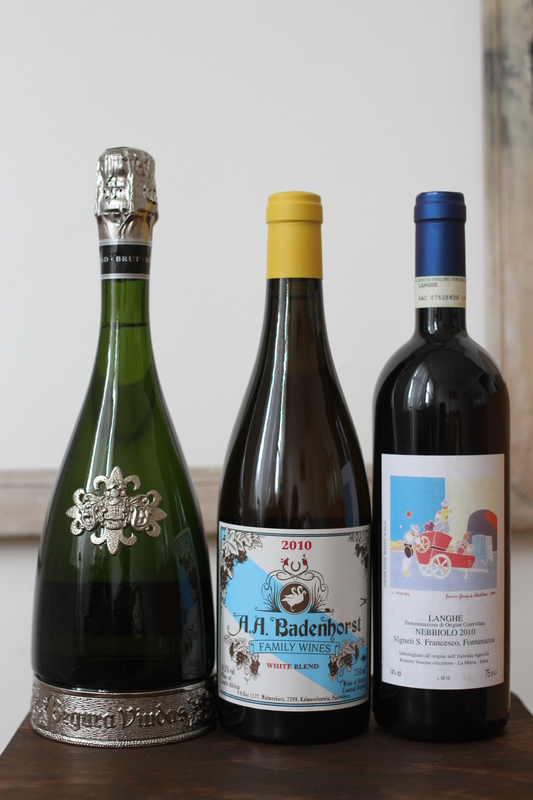 These include rare wines such as Ceretto Bricco Rocche Barolo Brunate 1990, Produttori del Barbaresco Montefico 1985, Mastrojanni Brunello di Montalcino Schiena d’Asino 1990, Tedeschi Amarone della Valpolicella ‘Monte Olmi’ 1991, Castello di Ama Chianti Classico 1997 and even the famous Toscana IGT wine Antinori’s Tignanello 1985 and Bolgheri’s inimitable Tenuta San Guido Sassicaia DOC 1987. In total, the combined age of these wines is over 200 years. This was a once-in-a-lifetime opportunity and one that I feel privileged to have been able to pour at. Below is a visual diary of the evening with small commentary made as to the condition of the wines. That may be a quote that I stole from the movie Anchorman – The Legend of Ron Burgundy , but such a highly intelligent saying could also be applied to the wine style rosé. We are in the midst of a Rosé revolution that hosts events through the month of November. However according to my standards of rosé appreciation and ridiculously good mathematical calculations, it is actually a beverage that has the capacity to be consumed during two thirds of the year, if not more. Melbourne weather permitting, I am referring to the period from the end of October to the start of May. “60% of the time…it works every time”. 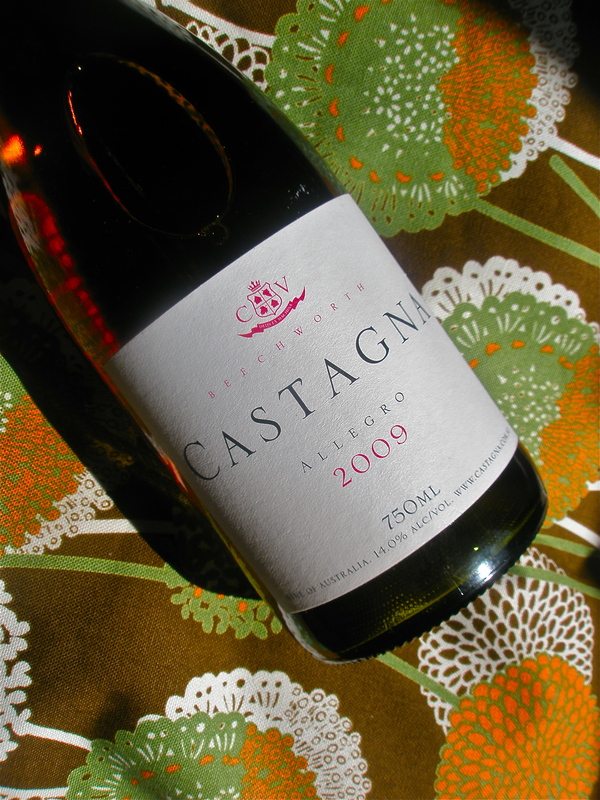 On November 10th, I celebrated the beginning of the revolution with this rosé from Castagna called Allegro, which easily confirmed its position as one of Australia’s top rosé wines. What can I say? It is difficult to dislike such a pretty peach, salmon, blush hued wine. Well actually no. That was a blatant lie because if the wine did not perform and do wondrous things in my mouth then I would not speak of it so highly. Fear not, Julian Castagna has created a wicked rosé mistress of layered complexity like no other. She beckons you forth by opening with a perfume of sweet pink musk followed by a gentle puff of smoke. Soft and playful on the palate, she kisses you with sugared almond lips dusted with vanilla icing. Texturally, Madame rosé has got curves in all the right places and in the right proportions with that final flavoured flush of rose water pinning you down for another glass. She brings an impressive 14.00% alcohol to the table, but with such a vivacious personality, it is no wonder that you are more than tempted to have a bit of a play with the alluring rosé. Last week I found myself in the country town of Mildura for the Australian Alternative Varieties Wine Show, or the AAVWS as it is perhaps more commonly known by the acronymphiles. I was keen to participate so signed up as a Steward and attempted to prepare myself physically and mentally for the unexpected. After all, this was the event they titled, “More than just a wine show“. So I threw on one of my favourite David Bowie albums, Hunky Dory, and pushed play on Track 5 for a little inspiration. It has been 9295 days since my last confession. I accuse myself of the following sins. Absolve me if you see fit. Last Wednesday night in a quiet, private room within the Circa The Prince complex, I found myself surrounded by nine much older and wiser gentlemen, where I then proceeded to try the finest white wines that I have ever had the privilege of putting past my lips. 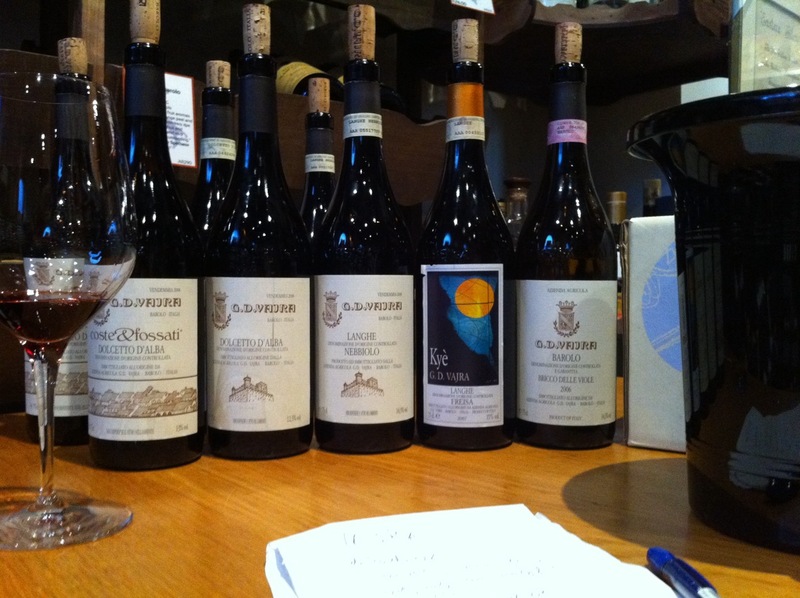 Nebbiolo: King of the Langhe (ie: Barolo & Barbaresco). Is its noble status achievable in some Australian regions? NEBBIOLO IS REGARDED AS THE ‘KING OF THE LANGHE’ WITH THE BEST – BAROLO AND BARBARESCO – POSSESSING OUTSTANDING AROMATIC COMPLEXITY, TANNIC POWER AND EXCEPTIONAL AGEING POTENTIAL. WHAT GIVES THIS GRAPE VARIETY ITS UNDENIABLE DISTINCTIVENESS IN ITS HOMELAND AND CAN IT ACHIEVE SOMETHING SIMILAR IN AUSTRALIA? DISCUSS WITH REFERENCE TO THE VINE, SOIL, CLIMATE, VINIFICATION, MATURATION AND SENSORY CHARACTERISTICS. Ancient Greeks referred to Italy as Oenotria – the land of wine 1. It is an apt description for the geographical ‘boot’ of Italy, which embraces a variety of climates and soils allowing for diverse opportunities in grape cultivation 2. The native grape of particular fame is Nebbiolo from the Barolo and Barbaresco zones, which herald from north-western Italy in the Langhe hills of the Piemonte region 3. Ample reasons exist for its elite status, but discussion will also be directed towards how Nebbiolo fares in Australia, where the illustrious qualities of Italian Nebbiolo wines convinced many Australian winemakers to plant the fickle grape, perhaps not always in areas best suited to the representation of its classic tar and roses character. 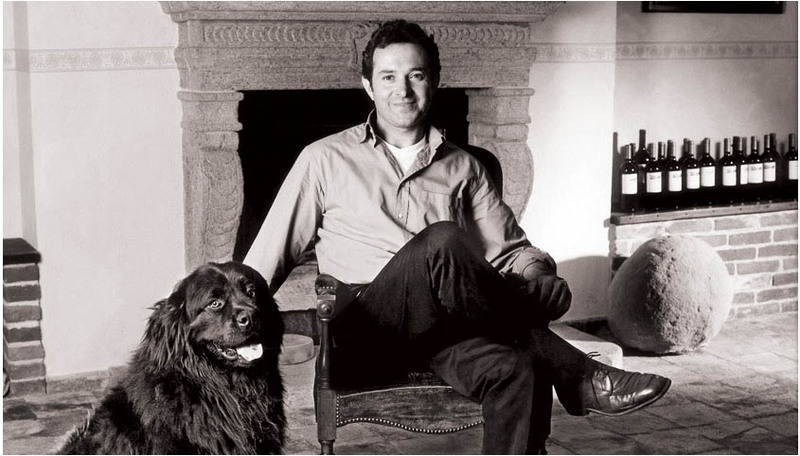 The wine world lost one of its greats back in 2001 when the driven and ardent Roero vine dresser Matteo was taken unexpectedly in an accident in the vineyard. Prior to his death, Matteo had worked fervently to establish the sandy soils and the vines of the Roero as fruit that could one day be held next to the great Langhe vines. His dedication to his craft meant he gradually bought the vineyards that he knew ripened the best and had the best exposures and sold off those he knew he would rather do without. When at last the world took notice to his beautiful wines, it was all be taken away from him and the estate was left in his wife Ornella’s capable hands. The wines are now made under the direction of enologist Luca Rostagno – the man Matteo wanted to make the wine in his cellar. Matteo Correggia’s estate is based on the northern side of the Tanaro river in Piemonte in the area known as the Roero (rather than the more southerly and well-known Langhe wine region). It is an area long-renowned for the native white grape Arneis, a wine that is usually unoaked and consumed when young and is a beautiful accompaniment to fish dishes. It is the reds though that are commanding due attention, with a classic Roero rosso like Matteo Correggia’s La Val dei Preti or earlier maturing Roero made from 100% Nebbiolo in the Canale d’Alba region of the Roero hills. These wines tend to be lower in price also due to a lower demand with the majority of people going for the more publicised Langhe wine region. So I say, scoop up a bargain, put your feelers out there, and the next time you come across a wine with Roero on the label, well apart from knowing a little more about the area now, you can feel confident that it is an area producing reputable, delicious wines worthy of the purchase! Trust me! Oh dear, I was glancing through photos and realised I hadn’t even written up the trip to see Luke Lambert and his wines in the Yarra Valley back on November the 1st. My cousin Amanda is a massive cheese geek and overall foodie. We complement one another perfectly because I’m the massive wine nerd who also loves to eat food. Do you see how we mesh so well now? After little debate, I convinced Amanda to take the day off work for health reasons and to accompany me on a visit to the Yarra Valley. First stop? Madden’s Rise Winery off the Maroondah Highway and also Luke Lambert‘s hideaway where he weaves his own magic. 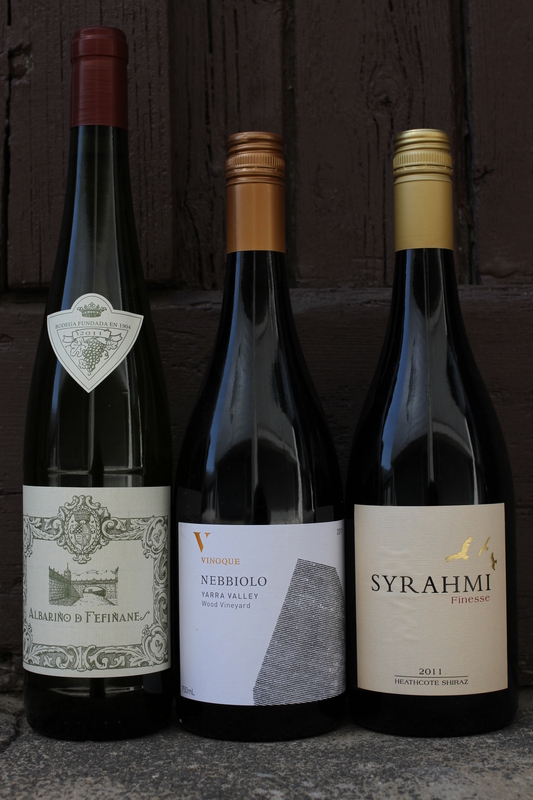 Sorrenberg’s Barry Morey’s humble offerings earn praise year after year, whether it is for his Sauvignon Blanc/ Semillon, or his stunning Chardonnay which I tend to pine for every so often. His latest Gamay continues this strong tradition. Intriguingly it contains a small portion of Pinot Noir to combine two French styles of Beaujolais and Burgundy. The result is seamless but remarkably distinct with red berry aromatics tied to a hint of fresh cherry. For something made in the depths of a cellar underneath Barry’s house, the wine is a true delight said by those who know all about it. 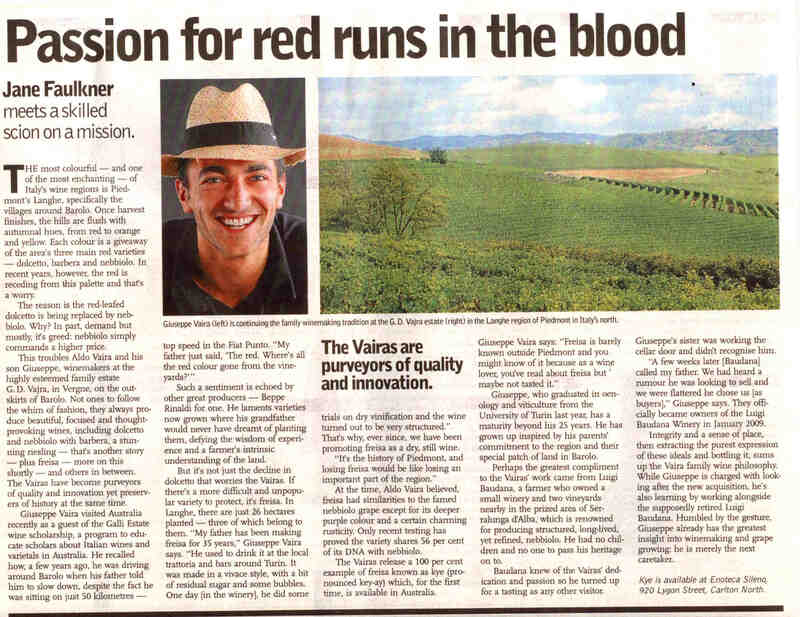 In January 2011 Steve Pannell spread the Aussie love with his ‘All for One Wine’ campaign promoting Australian wines. With so many grape variety options here in Australia and to align myself for a moment with SC Pannell’s thinking, why would I venture overseas just for the day?! (Rheotorical question DO NOT ANSWER!). OK, so be warned. I am a self-confessed Neb-head. For a variety that some would say is more easily misunderstood than appreciated, I am an ardent advocate of the Nebbiolo grape. The 2007 is classic in style from the autumnal colour, to the delicate red fruits that are beginning to edge into a more savoury tone. The picture is completed by the wonderfully high acidity that is balanced by its lashing of tannin and palate weight. Steve Pannell really is an exceptional producer of this complex variety. Share the Aussie love if you wish. As the Best Italian Varietal for the 2011 Good Wine Guide, Mario Marson’s most recent vintage provides the perfect template from which to benchmark great Aussie Sangiovese. A backbone of freshly picked cherries with hints of bramble and a lick of vanilla are complemented by a taut acidity, firm tannic kick and almond meal finish. Get on it. For their nineteenth vintage, Grosset has continued to drive for distinction, undoubtedly (and enviably) having one of the best styles in the country. Made from 60% Clare Valley Semillon and 40% Adelaide Hills Sauvignon Blanc, this blend never disappoints in its flavoursome offering of tight citrus and pristine stone fruit perfumes. The overall lemon core provides the generous length and mouthwatering texture. A wine of this intensity will further evolve in the glass so don’t drink it too quickly!